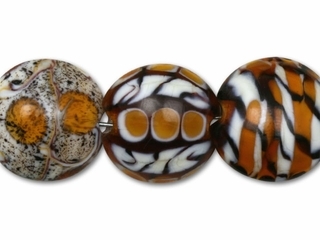 These gorgeous animal print beads will make your designs the focus of attention! They are ideal for earrings, bracelets and necklaces. Use just one bead on a cell phone finding. Mix them with pearls, gemstone beads and Swarovski crystal. The intense color of these seven beads simply has to be seen in person. Of course the beads are handmade, so there will be slight variations from one strand to the next, but you will be truly amazed at how consistent the artist is able to make them! Made in USA.